To obtain a driving licence in Mauritius, you have to pass 2 tests – a theory and a practical one. The theory part is most commonly referred to as the oral test because it used to be conducted as an oral examination. People who do not understand English or French usually take the actual oral version of the test which involves an examiner reading the questions and answers out loud in Creole. However most learner drivers nowadays opt for the computerised version of the test. It costs Rs500 to sit the test. When you sit the test, you will have 20 minutes to answer 40 questions on the Highway Code. Although you have 30 seconds for a given question, if you are not able to answer within that 30 seconds period, you will not get the opportunity to go back to that question again as the computer system will move on to the next question until all 40 questions have been shown which then triggers the end of the exam. So remember to mark your answer for each question before your 30 seconds time limit is up. And for those who are quick to answer, unfortunately you cannot go to the next question until all 30 seconds have elapsed. 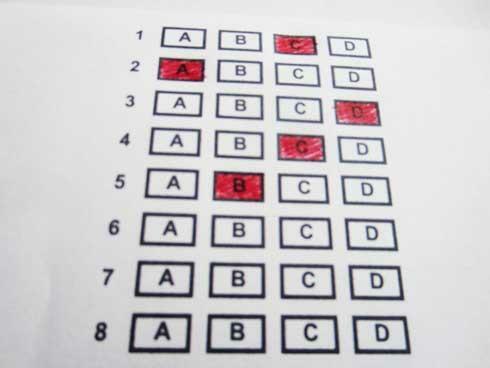 Contrary to popular belief, although the test is supposed to be computerised, only the questions and answers will be displayed on a computer screen but you will need to circle your chosen answer (A, B, C or D) on a sheet of paper as there’s no way to mark down your answer on the computer system itself. There is also an audio system in the test centre which reads out the questions & answers for everyone to hear, hence the name audio visual test. To pass the oral test, you can make a maximum of 6 errors but if you get any more questions wrong, then you will fail. Note that the first 5 questions do not count and are only included in the test to make you feel comfortable with the system, so only the 35 questions which follow carry points. At the end of the test, your answer sheet will be scanned by the police officer in charge and you will get your results immediately. If you fail, you will need to book another test and will have to pay another Rs500 again (fee for oral test appointment). For the lucky ones who pass, they can now concentrate on the practical side of the driving test but for the others, it means another trip to Les Casernes in Port-Louis for another assessment. The best way to pass an examination is to learn and practice until you become knowledgeable and confident. You should consider buying the Highway Code book which is available in most book shops for Rs150. On top of explaining the different rules and traffic signs, you can also test your knowledge with the Q&A found at the end of the book. This is highly recommended. If you want a more realistic approach to the test though, you can try our learner driver test quiz, which is an online testing application. Practice the questions as much as you can to increase your chances of passing and to build up your confidence. Since this is a skill for life, you should not memorise the questions/answers, that is learn by heart, because you need to understand the concept and rules behind those questions to become a good driver. So revise well and good luck! They give you a black permanent marker. You have to be very patient at first. As soon as you go into the room , you will be seated downstairs. Then all of the batch will move upstairs. Some people tend to say they are harsh. But for me it was a good experience. Overaal : good experience ! Do you still remember how many questions were on actual traffic signs compared to being open questions? If you can give us a percentage, that would be great. Thanks. Around 30 were on traffic signs and around 8-10 open questions. If you revise well, you can easily get all traffic symbol questions correct. They are so direct! The other questions might be little bit more confusing . So secure the maximum number of marks with the traffic symbol questions! Thanks for sharing your experience, very much appreciated. Tips: read the book and do all the tests. It will show which areas one is unsure about. Different stop signs, bends and junctions, give way signs, reaching a two way after coming out of a one way, no parking or standing signs... Only one answer per question, so it's very logical and no traps as such. Good luck! Part of it is true . Not all are bogus. Hi, I was wondering how much it costs for the oral test? Oops, I thought I mentioned it in the article. The oral test fee is Rs500. I've updated the post to include this now. Do you happen to know the fee for the practical test? Hello, I recently passed the oral exam. It was free. Hello, i know i am reviving a dead thread but a little of help would be highly appreciated. If i want to know where someone having a learner can drive ? on which roads and so on ? where do i need to look online ? This article is very helpful I've just apply for a learner and waiting for the call to go to oral. Yes, I recently passed it and it was free. Hello, it's not very difficult. You have to remain concentrated till the end, that's all. There is a sort of run test at the beginning for everyone to be used to filling the exam sheet. So, the first 5 answers don't count in the total. One advice: finish ALL the tests in the book. And go over the errors twice, go back to the page, read about it and try to understand why u got confused. These are the main signs that.. as a driver you must master for ur own security! Good luck! And maybe ask someone to flip through the book and ask u random questions and u draw the answer. :) Make it fun! This is actually a good question, I have been reading many articles on the topic of obtaining licenses in Mauritius and not one of them has stated whether or not a provisional license for either motorcycles or vehicles allows one to actually operate the motorcycle or car. It makes sense that in Mauritius they would allow for it as most countries follow this law but with limited responsibilities. Can anyone offer more insight on this matter? It's not available online but is a great reference book. please.Can you tell me which website should I apply for my learner driving lisence? thank you dear will do as u said. When do you receive your leaner license? is it after having passed your oral test? Hello,I need some help. Can i cancel my oral test for tomorrow? I had the best grades for the test aha..Yeah, they shout out loud the results. Do I need to sit another oral test for motorcyle if I already passed the audio visual test for autocycle and motor car?